Le Moyne College has a vibrant music program, providing students with the opportunity to continue their musical studies and participate in a wide range of performing ensembles. From the smooth sounds of the award-winning Jazzuits to the full instrumentation of the Le Moyne College Symphony Orchestra, Music at Le Moyne offers something for everyone! Make a donation to our Friends of the Arts fund by clicking here! 100% of every donation goes back to our students, helping them take on internships and other professional opportunities. 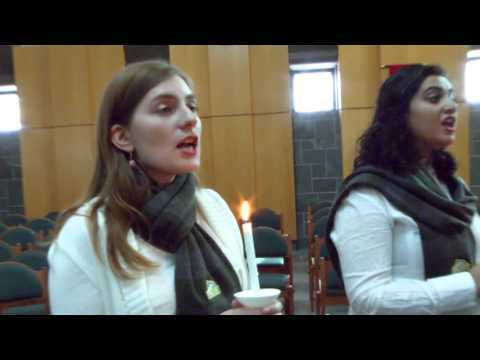 Students from the Le Moyne College Chamber Singers sang at a Naturalization Ceremony at the Federal Building in downtown Syracuse. The Honorable Judge Therese Dancks (Le Moyne Alumna) presided, and 45 people from 33 different countries became citizens of the United States. Chamber Singers director Danan Tsan sang along with students Amber Ford, Geraldine Wason and Noelle Killius. Songs included America the Beautiful, The Star-Spangled Banner and This Land is Your Land. If you would like to learn more about courses, requirements, and opportunities for the Music minor, please see the Music brochure or the Le Moyne College catalog. The primary responsibility of the Le Moyne College Music program is to provide effective instruction to students in musical arts within the liberal-arts environment and Jesuit tradition of Le Moyne. This instruction includes experiences to promote creativity, musical artistry, intellectual growth, and personal development. A further responsibility is to lead students in the production of vivid musical events for the Le Moyne and surrounding communities that engage audiences with the range and vitality of their content. Le Moyne College's music program offers private instruction for those interested in vocal or instrumental lessons. To express an interest in lessons, please click here. Students will develop an understanding of the fundamental languages and expressive elements of music - harmonic, melodic, rhythmic, textural and structural - and the ability to comprehend these elements in performance. Students will develop an awareness of the dynamics and practices of successful musical collaboration. Students will develop an understanding of the preparation process, techniques, and challenges of performing music. Students will develop knowledge of the theory and history of music and familiarity with major works in musical history. Students will develop an understanding of the interdisciplinary nature of music, combining the study of music with the study of another non-ancillary discipline. The Music Program boasts faculty with a broad variety of professional experiences and backgrounds. From award-winning composers and performers to respected clinicians and conductors, the faculty provides an expert approach to music development. 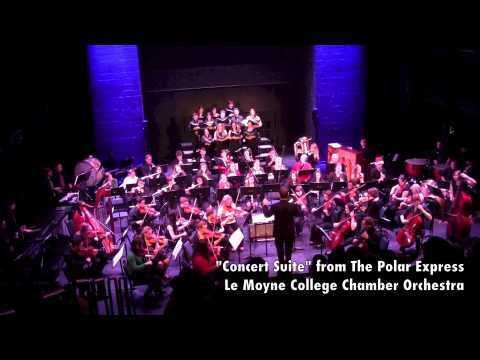 The Le Moyne College Symphony Orchestra (MUS 395A) boasts full instrumentation (featuring strings, woodwind, brass and percussion instruments) and performs multiple concerts both on an off campus each year. 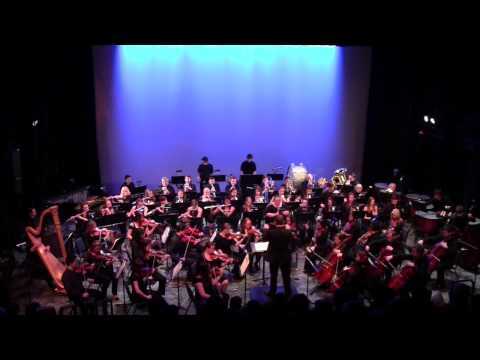 The orchestra performs music from all genres, including classical, film, pop, Broadway and more. For more information, email director Travis Newton. Rehearsal Time: Wednesday, 5:00-7:30 p.m.
Auditions: Wednesday, August 29, 4:30 p.m., PAC 214. All are welcome (no auditions for admittance; placement auditions only). Performing at the end of each semester, the Le Moyne College Jazz Ensemble (MUS 395B) aims to replicate the classic big band sound (Count Basie, Duke Ellington, Tommy Dorsey, Glenn Miller, etc.). Instrumentation consists of saxophones, trumpets, and trombones (with an occasional flute or clarinet) and a rhythm section of piano, bass, guitar and drums. For more information, email director Joe Carello. Rehearsal Time: Thursday, 7:00-9:30 p.m.
Auditions: Thursday, August 30, 7 p.m., PAC 219. All are welcome (no auditions for admittance; placement auditions only). The Le Moyne Rock Ensemble (MUS 395C) explores the world of rock music from 1955 to the present. Students listen to, discuss, and arrange songs, in addition to collaborating on original songwriting as well. Rehearsals culminate in a public performance. The group is open to both instrumentalists and vocalists. For more information, email director Edward Ruchalski. Rehearsal Time: Monday, 4:00-6:30 p.m.
Audition required: contact Professor Edward Ruchalski. Maria from "West Side Story"
The Imperial March from "Star Wars"
The Le Moyne College Chamber Singers (MUS 394C) specialize in a mostly classical repertoire, including madrigals, operettas and works by modern classical composers. The Chamber Singers consist of 16 voices or less and perform towards the end of the semester. For more information, email director Danan Tsan. Rehearsal Time: Tuesday, 6:30-9:00 p.m.
Audition required: Friday, August 31, 5:00 p.m., PAC 219. Accompanist provided. The LMC Jazzuits (MUS 394A) formed in 2004 under the direction of Carol Jacobe. Specializing in vocal jazz repertoire and songs from the Great American Songbook, the Jazzuits are very active with performances on the Le Moyne campus as well as participating in jazz festivals, workshops and community performances. For more information, email director Carol Jacobe. Rehearsal Time: Tuesday and Thursday, 4:00-6:00 p.m.
Audition Required: Friday, August 31, 5:00 p.m., PAC 219. Accompanisit provided. 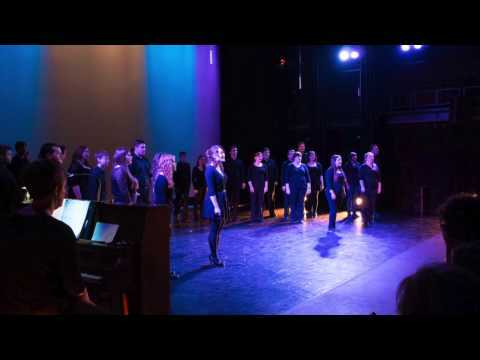 The Le Moyne College Singers (MUS 394B) specialize in musical theatre and contemporary repertoire. The ensemble is open to singers from the entire Le Moyne community, including students, faculty and staff, with concerts are scheduled throughout the semester. For more information, email director Danan Tsan. 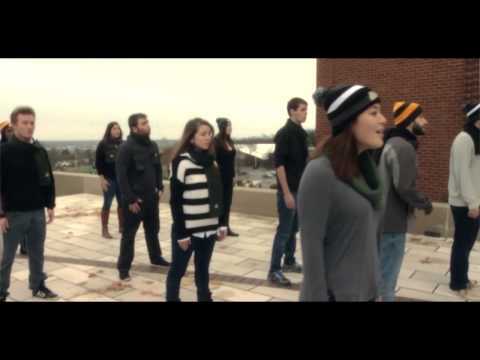 Rehearsal Time: Monday and Wednesday, 4:00-5:30 p.m.
Fermata Nowhere is Le Moyne College's very own a cappella group. Founded in the Fall of 2009 by Stephanie Whittemore and Luke Baker, this coed group of students is completely student run. Fermata Nowhere prides itself on offering its audience fun-filled, student friendly performances packed with enthusiasm and showmanship. Click Here to join Fermata Nowhere on Facebook. For more information, email faculty moderator Greg Giovanini. Audition required: Friday, August 31, 8 p.m., PAC 219. O Fortuna from "Carmina Burana"
Corner of the Sky from "Pippin"
Heart and Music from "A New Brain"